So much yarn, so little time. : Props - part two! I'm going to start with Pamela of Bazketmakr. 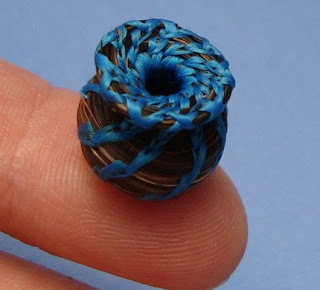 I don't generally consider myself a very visual person, but if I read that her tiny basket is 10mm x 14mm I just think "Ok, that's pretty small". For me, seeing one balancing on her fingertip is a fabulous use of a prop! Now I *really* know it's tiny! 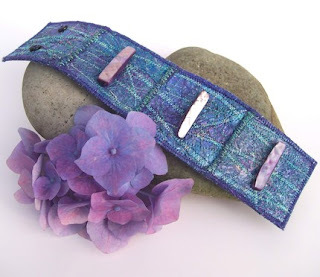 Aileen used a hydrangea flower and some stones to set off her new cuff. I think the colours in the flower really enhance her work. LaughingFridge guessed (correctly in my case!) that we'd misread the title of her musical background behind this froggy magnet! 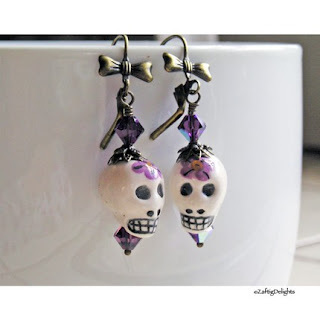 ZaftigDelights uses a huge soup bowl to hang her earrings from. I like the hint of reflection in the shiny surface. I'm picturing Jackie from DogDaisy gazing around her kitchen and spotting the lemons she's used in this photo. The contrasting textures and colour work really well. 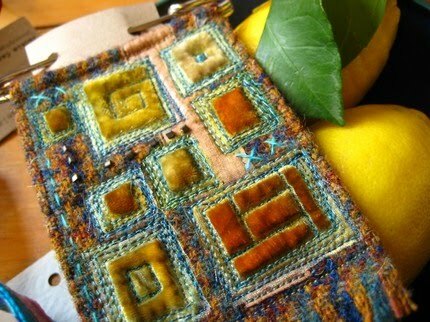 I love that fiber art piece - amazing! And the chocolates, here I thought they were meringues! How did I miss they are chocolate?!?!? Wow, I really do love how the props make the items pop! Liking the look of the chocolate clouds, does she do samples...............! I tend to have no props no colour, nothing! I use white wall and white card or mantle shelf and use shadow. Otherwise in the garden against white painted brick wall, white old painted door or a mosacic shell wall. The only prop I can think of I love and will be using again is the olf chair (with no seat.. Thanks everyone - and blondedesign that's the most perfect use of a chair with no seat! Jaci you got me worried then, thought I'd misrepresented nikid's work! Great Heather! Thank you so much : ) I'll have to get creative over the next while with the props though as the garden flowers are all dying off. I think there is one hardy bit of honeysuckle left then it will be shop bought flowers....what a shame, I'll have to buy myself flowers every week! Those chocolate clouds have me reaching for a teaspoon and the Nutella jar as a way of fulfilling the instant craving they gave me! HEY - THANKS! 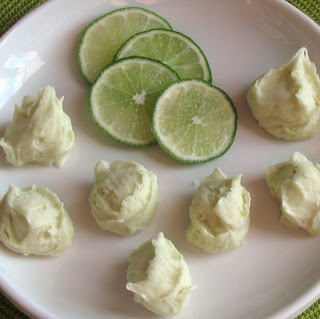 I did not expect to see my key lime clouds here! Every item you included is AWESOME! Nice products and pictures everyone! hi nifty you are right, i do use props! thanks for featuring my little basket (and finger.) You are so good with this blog stuff, you always have a great new idea, and i love it! 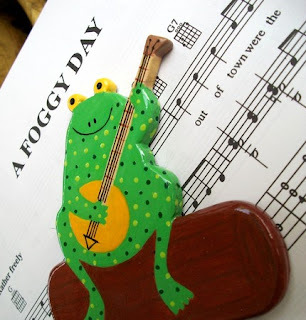 Heather, thanks so much for featuring our froggy photo prop with the subliminal message, heehee. The other photos and items are fantastic in their use of props!